Claude-Louis Mathieu was born in Mâcon, the capital of Saône-et-Loire in the Bourgogne region of east-central France, to the north of Lyon. Mâcon was an episcopal see at the time of his birth, but this ended in 1790. In 1799, when Claude was sixteen years old, he saw the former Cathedral of Saint-Vincent being demolished. His father had wanted him to become a carpenter but while he attended the free school in Mâcon he developed a liking for mathematics. After leaving the school he continued his studies on his own, helped only by the elderly priest Abbé Sigorne. Having heard about exciting educational developments in Paris where the École Polytechnique, a state supported institution of higher education and research, had been founded by Lazare Carnot and Gaspard Monge in 1794, he went to Paris in 1801 to try to gain admission to the École. His family were poor and he had practically no money to support himself, but he was able to find a room to live in under Jean Baptiste Delambre's observatory. He took a course at the École Centrale des Quatre Nations to prepare for entry to the École Polytechnique and began his studies there in the autumn of 1803, entering at the same time as François Arago. Mathieu and Arago quickly became friends (Mathieu later become Arago's brother-in-law when he married his sister in 1821). Mathieu graduated in 1805 and became a student engineer of Ponts et Chaussées. Arago, however, had been appointed as secretary of the Paris Observatory in 1804. Later he was sent with Jean-Baptiste Biot to continue the measurements of the arc of the meridian which had been carried out by Delambre and Pierre Méchain until the death of the latter. After Arago and Biot left Paris in 1806 to begin their measurements in Spain, Mathieu was appointed as secretary of the Paris Observatory to replace Arago. In the following year he was promoted to assist Delambre who was the director of the Observatory. In 1808 Mathieu, together with the astronomers Alexis Bouvard and Jean Burckhardt, worked on reducing the data obtained by Arago and Biot in their extension of the meridian measurements to the Balearic Islands. In the same year, together with Biot, he embarked on a series of measurements of the length of the seconds pendulum at different points on the meridian, in particular at Bordeaux and at Dunkirk. Both Mathieu and Biot received a prize from the Academy of Sciences in 1809 for this highly accurate work, and in 1812 they received a second prize from the Academy for their achievements. Between August 1812 and November 1813, Mathieu and Arago carried out numerous observations on the star 61 Cygni, attempting to measure its parallax. This star was thought (correctly) to be relatively close since Giuseppe Piazzi had shown in 1804 that it had a large proper motion, a fact which had been brought to the attention of all astronomers by Wilhelm Bessel in 1812. Mathieu and Arago arrived at the correct conclusion that the parallax of this star was less than half a second, but the actual determination of its parallax had to wait until 1838 when Bessel computed it. Charles Messier, the comet hunter who produced his famous catalogue of extended sky objects, died on 12 April 1817 and so a place in the Astronomy Section of the Academy of Sciences became vacant. Mathieu was elected to fill this vacant place later that year. In the same year he was appointed deputy at the Bureau des Longitudes. In addition in 1817, he was appointed as répétiteur by Arago for his course on Geodesy at the École Polytechnique, and by Delambre for his course on Astronomy at the Collège de France. As we mentioned above, Mathieu married the younger of Arago's two sisters in 1821; their daughter married the astronomer Auguste-Ernest Paul Laugier. Mathieu was appointed professor of analysis at the École Polytechnique in 1828, a position he held for ten years when he resigned to take up an appointment as an examiner for students completing their courses at the École. For many years Claude Mathieu's work for the Bureau des Longitudes involved editing the work on population statistics L'Annuaire du Bureau des Longitudes. In 1821, the year Mathieu married, Delambre was making careful preparations for his own death. He was himself a historian so knew the right way to go about ensuring that his biography would be presented in the way he wanted. He destroyed most of his personal papers and wrote a short autobiography. This was used by Mathieu as the basis for the biography of Delambre that he wrote and published in Biographie universelle Ⓣ. Delambre had published five volumes of his history of astronomy but left the sixth volume L'Histoire de l'astronomie au XVIII siècle Ⓣ unpublished. He only included astronomers who were deceased and as he wanted himself included in the volume it had to wait until he died. 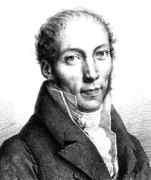 Mathieu, who had been left as Delambre's scientific executor, completed the work and it was published in 1827. Also unpublished was Delambre's The size and shape of the earth. In this he discussed in detail the fact that Méchain had deliberately falsified the data when measuring the meridian and this made Mathieu decide not to publish the work as he felt it might damage the case he was making for having the metric system reinstated. The metric system had become obligatory throughout France in September 1801 but had been rescinded by Napoleon in 1812. Mathieu was one of the two enthusiasts who did most to have the legislation to revive the metric system brought in, the other being Charles-Émile Laplace, the son of Pierre-Simon Laplace. By 1837 Mathieu was a representative for Mâcon in the House of Deputies. In fact he was elected as a radical deputy for Mâcon (1835-37, and 1838-48), taking a position on the extreme left of the chamber. He argued that the metric system would make France a modern, prosperous nation in the years to come, and it could be implemented at once because of France's glorious past achievements. He argued that people's rejection of the system had been based on a misunderstanding, and also argued that measuring the meridian had been a great achievement of the French Revolution. The fact that the project had been so major and unrepeatable was its great virtue, argued Mathieu, for the metre was now fixed for all time and even if the Archive Metre were damaged, its length was known in relation to the pendulum so could be reconstructed. The legislation gained widespread support in the House of Deputies in 1837, and as a result of their decisions the metric system became obligatory in France and its colonies from 1 January 1840. There was much resistance from the French people, however, and the old measures were still used in some parts of France into the 20th century. On 16 November 1869, the French government sent invitations to many countries to participate in an International Metre Commission. This was established in 1870 in Paris, meeting at the Conservatoire National des Arts et Métiers from 8 to 13 August 1870. Claude Mathieu was elected as the president of the Commission. After technical issues were examined by a committee which met from 2 to 14 April 1872, the Commission resumed for a second session from 24 September to 12 October 1872. The decision was to accept the Archive Metre as the definition of the metre without reference to the quadrant of the earth. The Commission had 30 prototype metres made using the Archive Metre as the reference. It is remarkable that Mathieu was able to undertake the work of president of this Commission despite being 90 years old. Those attending the Academy of Sciences in late 1874 were certain to see, every Monday, an old man more than ninety years old, the most senior member of the Company to which he had belonged for far more than half a century, who regularly attended meetings where he showed no sign of fatigue. A representative of another age, he had known intimately Delambre, and he was the brother-in-law of Arago. If his scientific work lacked the brilliance that had surrounded these great names, we do not honour him less giving unanimous respect to this modest and conscientious worker, concerned his whole life to make himself useful, while being an ardent patriot, always true to his beliefs as convictions of his youth. ... [Mathieu] managed to combine the independence and strength of the honest man with the kindness, the simplicity and the modesty of a scientist.